that seems to belong to a great beast. Broken knees as a whole. Well, the whole jaw was broken. There is a horror genre of which really very few films are made, and that’s the werewolf genre. We are inundated with films about zombies, all sorts of demonic forces and paranormal phenomena. But we don’t see our profusely hairy friend that often. There are only a limited number of successful werewolf movies like “The Wolfman“, “Silver Bullet” and “The Howling“. “An American Werewolf in London” is for me a classic and a jewel in this genre. It’s no surprise that this film won an Oscar and a Saturn award for best grimage. Of course there are also some misfires in terms of grimage, special effects and content such as “Night Wolf” for example. In “Wer” (ridiculous movie title by the way) it’s not a werewolf we get to see, but rather a “Wolfman”. This means you won’t see a real transformation into a wolf and the corresponding creature has excessive hair growth, an impressive stature and probably strong jaws with disproportionate grown teeth. It’s not really the appearance and movement of a wolf (although we do get a glimpse of this at the end). 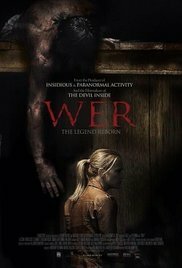 Just as “Afflicted” managed to revive an old horror genre (in this case about vampires), of which films are made into infinity with all necessary and related clichés, by approaching the subject from a different angle, “Wer” tried it with the werewolves genre. It’s also starting with a found-footage part where we witness how an American family, on holiday in France, becomes the victim of an unknown creature that tears them into shreds. After a while the obscure,strange individual Gwynek Talan (Brian Scott O’Connor) is arrested. He’s suspect number one and accused of being the person who committed this terrible crime. An imposing person with hands like coal shovels and who looks like a walking hairy carpet. Talan is entitled to a lawyer and that’s when Kate Moore (AJ Cook) comes up with two assistants Eric Sarin (Vic Sahay) and Gavin Flemyng (Sebastian Roche). You can divide the movie into two parts. The first part is the least interesting part (to be honest it’s fairly boring). A.J.Cook wasn’t really convincing as a lawyer and came across as a timid lightweight advocate. It’s only until Talan is subjected to a medical examination to determine whether he suffers from Porphyria, a disorder which affects the hair grow and the body length of a person, the situation starts to escalate. This disease is also important evidence because if someone suffers from this condition he can’t move that fast anyway. So it could be the ultimate proof that Talan might not be the culprit. The principle of a werewolf is approached in a scientific way. Kind of original. The second part is flashy and brutal with quite a few skulls being crushed and a whole bunch French policemen being dismembered. A rapidly moving violent werewolf who, despite its almost human form, goes on a killing spree in a monstrous way, leaving behind an unreal bloody trace. Despite the limited budget, the used SE’s are realistic and there’s never a feeling that too much CGI was used. We get a ferocious werewolf that causes a true massacre. Also Gavin will provide an extra surprise which will lead to a fairly grotesque and absurd ending. Need I say that Sebastian Roche treats us to a wonderful acting performance. Despite the slow start, where really nothing interesting happens, and the absurd ending, it still resulted in an eerie, terrifying and intense monster movie which is still worth to give it a try. Even the found-footage (of which I’m not really such a big fan) didn’t really bother me. It’s self-evident this isn’t really a family film. There are some explicit images of mutilated bodies and a blood-stained looming figure, that turns this into an ominous film. It surely isn’t exactly intended for little kids. It won’t go down in history as the most successful werewolf movie of all time, but it certainly is way better than all the pitiful efforts which have been undertaken over the last 10 years.